It’s the turn of the top milers in Japan to step out and do battle on Sunday, Nov. 18, when Kyoto Racecourse will once again stage the Grade 1 Mile Championship, the second race in the Japan Autumn International Series of races. The 35th running of the race has drawn 20 nominations, including four 3-year-olds, and last year’s winner Persian Knight. The race is run on the outer turf course at Kyoto, with the start in the backstretch, and some undulations in the run before the runners meet the relatively benign home straight and come past the stands to the winning post. 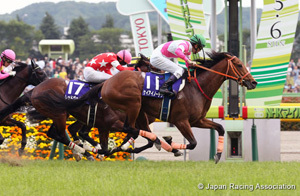 Step races leading into this year’s Mile Championship have included the Grade 2 Mainichi Broadcast. Swan Stakes over 1,400 meters at Kyoto, Grade 3 Fuji Stakes over1,600 meters at Tokyo, and Grade 2 Mainichi Okan over 1,800 meters at Tokyo. All of these races were run in October. Favorites have fared quite badly in the Mile Championship of late, with just one winning in the last 10 years. The race is for 3-year-olds and above, with horses aged four and above set to carry 57kg, while 3-year-olds carry 56kg, and fillies and mares claim a 2kg allowance. The record time for the race is held by Danon Shark, who won in 2014 in a time of 1 minute, 31.5 seconds. Five-year-olds have weighed in with the best results recently, with four of them winning in the past decade. Persian Knight will be looking to become the sixth horse in the history of the race to win in consecutive years. This year’s winner’s check is ¥110 million. The Grade 1 Mile Championship will be Race 11 on the card on Sunday, with a post time of 15:40 local time. Persian Knight: Last year’s winner is back for another try at the race, and he has three wins from seven starts over a mile, and could be considered slightly unlucky in his latest start in the Grade 3 Fuji Stakes over a mile at Tokyo when he finished fifth. Trainer Yasutoshi Ikee is hoping for better things. “He got cut off in the straight in the Fuji Stakes, and he had to carry 59kg, as well as returning from a break. It was too bad that for a horse that needs to be running on strongly at the finish, he wasn’t able to do so. Since then, he’s remained sharp and is in good condition,” Ikee said. Aerolithe: Even though the 4-year-old filly only has one win over a mile (the 2017 NHK Mile Cup), she has a great race record overall, finishing first or second nine times from 12 career starts. 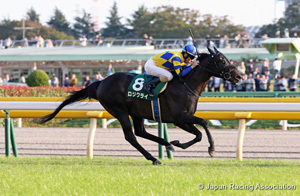 She is coming off a strong win most recently in the Grade 2 Mainichi Okan over 1,800 meters at Tokyo in October. 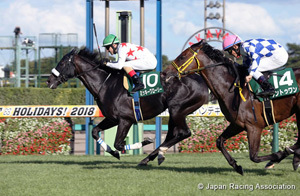 Trainer Takanori Kikuzawa said, “We weren’t sure how she might run last time, having been off for a while, but it was a great run and it was the first time she ran the last three furlongs in under 34 seconds. She’s had another break since and came back to the stable on Nov. 1. She seems very well in herself.” Aerolithe is expected to be ridden by Ryan Moore on Sunday. 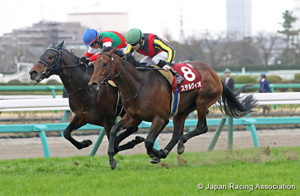 Keiai Nautique: The 3-year-old by Deep Impact was the winner of this year’s Grade 1 NHK Mile Cup at Tokyo in May. He has had two runs at Kyoto where he finished second and third, and most recently he finished fifth in the Grade 2 Mainichi Okan. He has only been unplaced twice in an eight-race career to date. 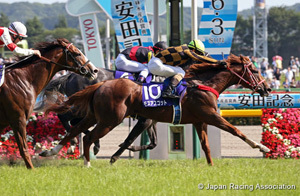 Trainer Osamu Hirata thinks highly of the horse. “His final three furlong time last time was faster than the winner, so you can’t say he didn’t run well. The slow early pace didn’t help. He put together some good results in the spring and I think he’s capable of doing that again,” Hirata said. Mikki Glory: Another horse by Deep Impact, the 5-year-old has only been unplaced once in 11 starts, which have included six wins. He’s coming off a win in the Grade 3 Keisei Hai Autumn Handicap over a mile at Nakayama in September, and while he’ll have to carry an extra 2kg this time, trainer Sakae Kunieda thinks he’s capable of a lot. “He’s taken a bit of time to come good, but he has improved, as we saw last time when he won a big race for the first time. I think he can still do more,” Kunieda said. 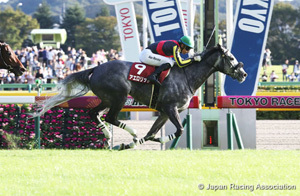 Stelvio: The 3-year-old colt by Lord Kanaloa is looking to give his trainer Tetsuya Kimura his first Grade 1 victory. 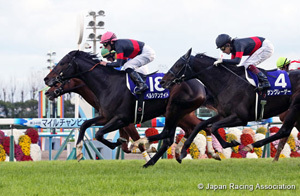 The horse is never too far away as can be seen from his fourth place in this year’s Grade 1 Satsuki Sho (Japanese 2000 Guineas), and an eighth place in the Grade 1 Tokyo Yushun (Japanese Derby). Beaten into second last time by Aerolithe, Stelvio will be looking for that little extra this time around under jockey William Buick.